The Phoenix Suns have come a long way since the heyday of the mid-2000s—back when two-time MVP Steve Nash still had his sights set on winning a championship, Mike D’Antoni was Coach of the Year material, and Boris Diaw was thin. If you ask the average NBA fan today, very few would even be able to name more than two of the Suns’ current starting five. With many referring to the Suns’ Ryan McDonough as the “accidental NBA Executive of the Year,” it is safe to say that no one expected this current roster to even have a shot at making the playoffs this season. The odds were even slimmer with Eric Bledsoe out of the lineup due to injury since December 30th. So, why are they winning? 1. Live and Die by the 3. As you would expect, they are also fairly efficient, averaging 37.6% for the season. 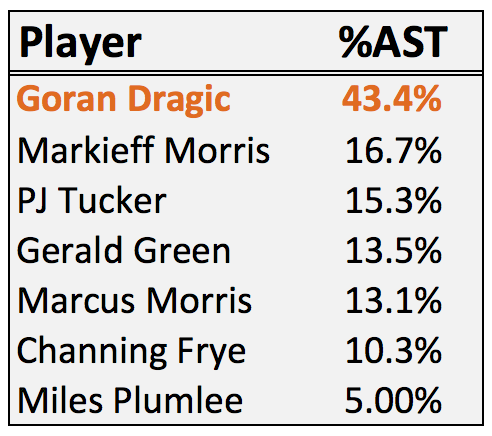 Goran Dragic leads the way with a three-point shooting percentage of 41.7%. (In case you are wondering, they are particularly good at the left corner three.) 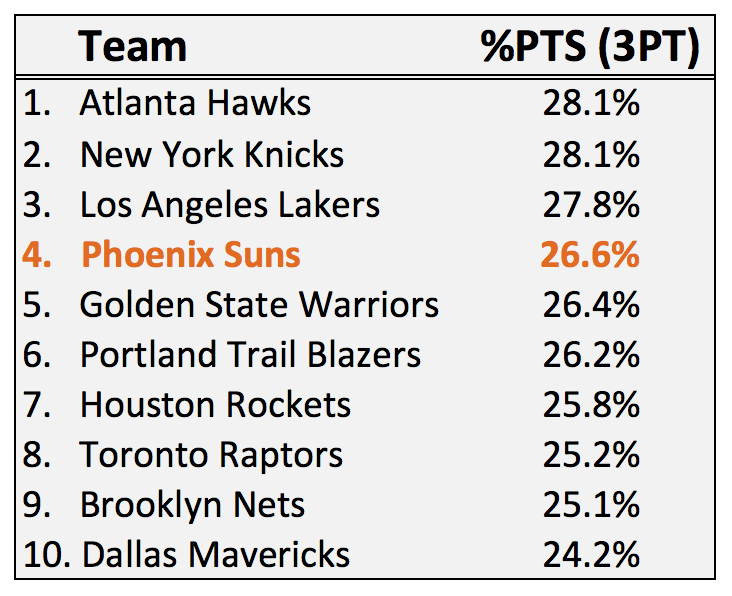 This style of play has put the Suns in the mix with some of the best teams in the league, in terms of scoring. They rank eighth in Offensive Rating, behind the Heat, Clippers, Mavericks, Blazers, Rockets, Thunder, and Spurs—all solid playoff-bound teams. Hopefully, this will be a key focus this month as they continue to compete for a playoff spot in the West. Otherwise, the Suns might find themselves in big trouble when they cannot hit the 100-point mark, usually due to poor performance from long range. 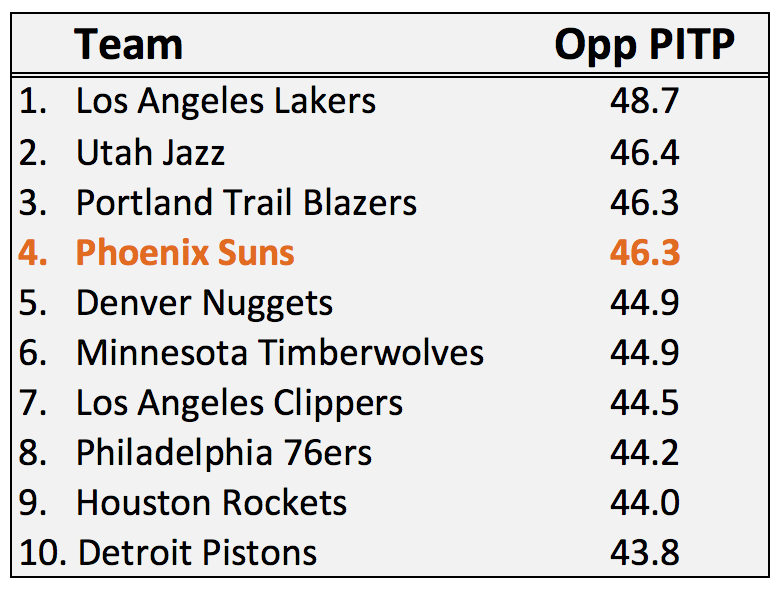 In fact, during losses the Suns’ 3FG% drops to just 33.6% versus 40.7% in games won. On the bright side, in the 5 games the Suns have played so far in March, they have averaged 23.0 assists. When Bledsoe returns to the lineup later this week, perhaps he can pitch in. 2. Weak on the Boards and in the Paint. They are particularly bad 10-14 feet away from the basket, allowing opponents to shoot a staggering 42.9%, second worst in the league after the Jazz. Luckily for the Suns, opponents have not been actively exploiting this deficiency on the whole. Only 7.5% of opponent shot attempts have been within this range, in-line with the league average of 8.1%. As a consequence of the Suns’ weak interior defense, they are also fourth worst in the league at opponent second chance points, giving up 14.4 points per game, on average. Thus, though simple, defensive rebounds can actually be a very useful indirect metric for keeping tabs on this Suns team’s defensive performance. Obviously, the more defensive boards they can track down, the less the risk of opponents scoring from second chance opportunities. Based on my model (described above), 33 is the magic number for the Suns. That is, if they can grab at least 33 defensive boards, then that is a good sign for their defense. However, what they may lack in the interior game, the Suns try to make up for from beyond the arc. They are the second best team in the league at guarding the three, holding opponents to just 33.8% shooting, on average, this season! The bottom line is that the Suns will always have a shot at winning as long as they can light up the scoreboard from long range. But we have a leaky bucket analogy on our hands due to their poor interior defense and lack of strong rebounding. As good as the Suns are at making volume threes, they cannot beat strong offenses consistently without holding their own on the defensive end. By winning against teams like the Thunder and Blazers, the Suns have been able to show us all what they are capable of, but their vulnerabilities are starting to become clear. A Walk Down Memory Lane for Suns Nation. In case I sound like a Debbie Downer, I would like to add that the Suns are playing unbelievably well, especially for a team without any official All-Stars. They even lead the league in fast break points, averaging 19.0 points per game. And, of course, we cannot forget Channing Frye, their big man who can shoot the three. Sound familiar? 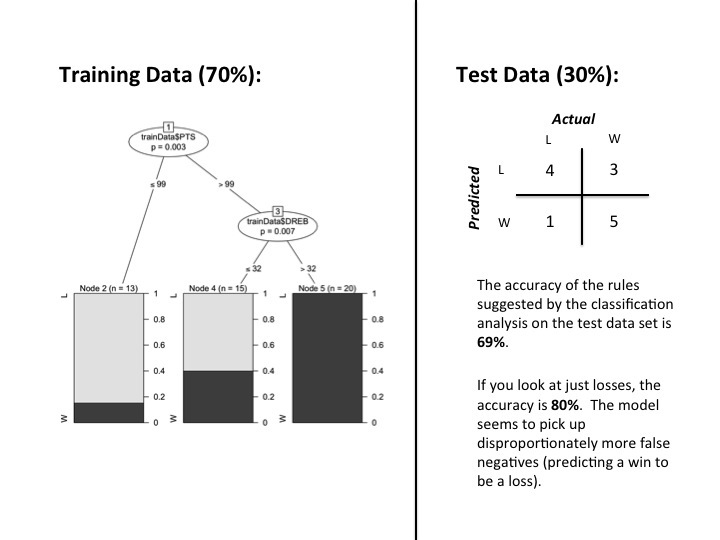 Adjusted Win Percentage: Where Does Your Team Stand?